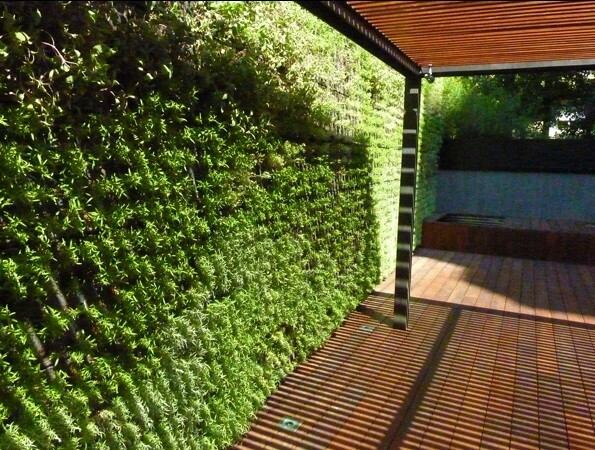 The vertical gardens are gardens installed in vertical planes by using technologies created especially to do it. In Babilon we design and install vertical gardens in fronts, medium walls or interior courts, integrating the vegetation in the architecture with a product that develops an ideal system of coating for his properties of refrigeration, isolation, absorption of CO2 and generation of oxygen. We also realize indoor decorations and small format works. The vertical gardens are alive coating that has the property of transforming and transforming the spaces where they are placed. Furthermore the vegetable grants support green spaces in urban zones in disuse and increase the coefficient of green space m2/citizen. In cities like Barcelona it is well below the recommended one. 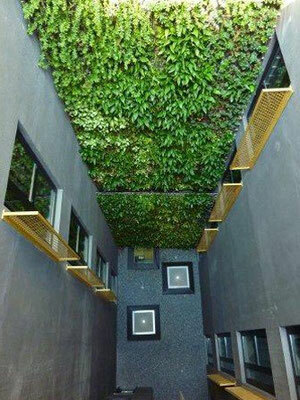 The vertical gardens could be established both in outdoor and indoor and therefore they improve the life quality in cities and inside the buildings. The current systems of irrigation allow a very efficient and limited use of the water. We apply systems of fertirrigación and hidroponía. We have systems with recirculation of the water of the vertical garden and that permits a rationalized consume, less than in traditional gardening.